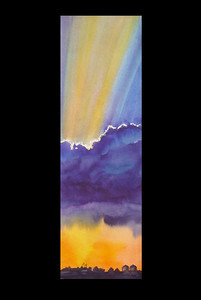 The "Tall Skies" series came about after seeing pastel works done in this vertical format. 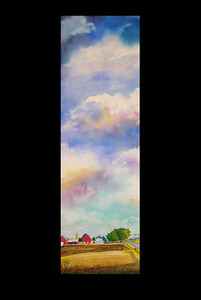 I have always liked that presentation and welcomed the opportunity to experiment with vivid colors in almost abstract sky compositions and then complete the works with vanishing farm scenes. 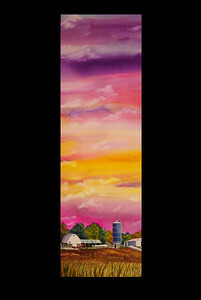 I paint barns, cribs, grain bins, silos, farmhouses, tractors, crop fields. I have also used this format for some lighthouse and water sunset compositions. The farm scenes, for me, recall a time of a more laid back lifestyle. Tiles In Shadow. 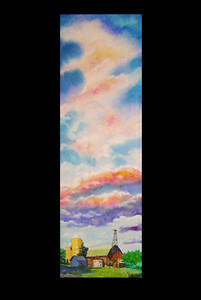 I had fun with the paint in the skies and enjoyed doing the barn and old windmill. These are all scenes that are disappearing from our land. This farm is in Nortern Illinois in Lake County. Painted on arches 140 lb. watercolor paper. 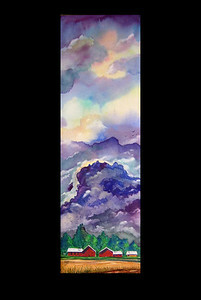 12" x 311/2" Original painting $350.00. This Lighthouse was one of my favorites in this series. I was very happy with how the strong color in the late day sun worked out. 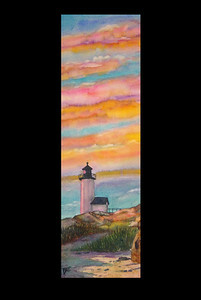 The path in the lower portion helps to lead the viewers eye into the center and up to the lighthouse. Another farm in the Midwest with a traditional hipped roof farmhouse and out buildings located next to a highway. 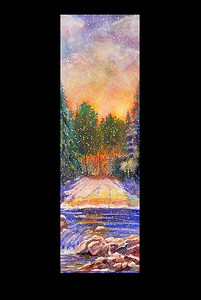 12" by 31 1/2" painted on arches 140 lb. watercolor paper. Big Blue Cloud was painted to see if I could achieve the strong white cloud edge and sun rays in the setting sunset. This original painted on 140 lb. paper has been sold. This little Winter Sunset was totally made up and was created solely for the Holiday Season. It was recently was auctioned off at a charity event.